Here is my famous Robot Pie recipe with special “Big Loo Style Ala Mode” topping. 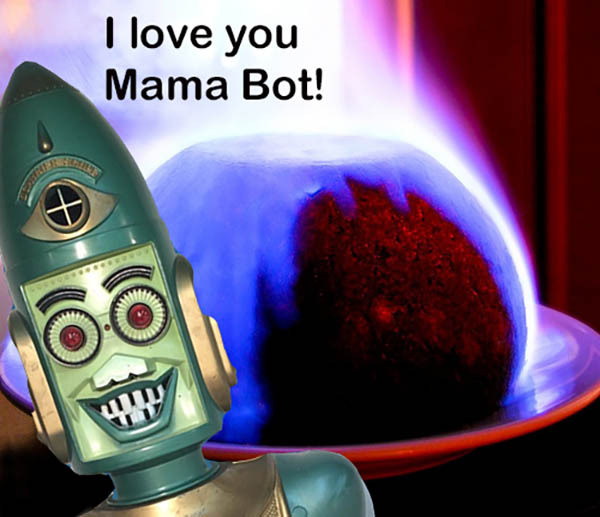 It has been a very long time since Mama Bot would make me a Robot Pie, mostly on my birthday or other special occasions. If someone wants to be really nice to me, I would love to come to over to your house for a slice of Robot Pie. It reminds me of growing up on the Moon and takes me back to that special place that only food and family can bring. I guess this is what you call comfort food! The ingredients are not that hard to find. A trip to the supermarket and a swing by the industrial supplies store is all that is needed. Yum, Yum! Stir the raisins, apples, orange zest, orange juice, and apple cider together in a pan. Simmer over medium heat, stirring occasionally, until apples are very soft, about 20 minutes. Stir in the sugar, cinnamon, cloves, and soda crackers until well blended. Refrigerate until ready to use, or pour apple mixture into the prepared pie crust. Top with the second crust. Pinch and crimp edges to seal the crusts. Pierce the top crust in several places with a fork. Reduce oven temperature to 350 degrees F (175 degrees C), and bake until top is golden brown, about 30 minutes more. Remove pie from oven and place on baking rack. Carefully sprinkle Magnesium shavings on browned crust. This is the “Big Loo Style” Ala mode feature. Turn broiler on and slide pie into oven with fire extinguisher at the ready (this is important). When Magnesium starts to lite off, remove pie before explosion occurs. My Dearest Big Loo. Oh honey, I would love to have you over for a slice of Robot Pie! You have been in my family since a very special Christmas morning when I woke up to open your giant Moon Robot box. If Robot Pie is what will bring memories of Mama Bot back to you, I will try really hard to find those Magnesium shavings!